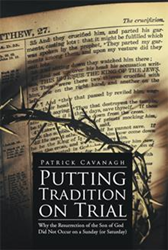 Compelled to examine and refute what he saw as erroneous traditional Christian beliefs regarding the death and resurrection of Christ, author Patrick Cavanagh courts controversy by “Putting Tradition on Trial” (published by Xlibris NZ). He dares to scrutinize the Scripture and its origins, dissecting one of the cornerstones of one of the Christian faith. “Putting Tradition on Trial” challenges the commonly-held beliefs that the Son of God was resurrected on either the first day of the week or the Sabbath day by comparing three popular Bible versions with literal translations of the relevant ancient Greek texts. Cavanagh’s aim is to enable the reader to clearly discern where and how the Scriptures have been altered to accommodate these doctrinally inspired interpretations. The author supports these with both astronomical calculations and historical evidence and identifies Jewish customs that no longer appear in the popular versions, which are a valuable aid in determining the correct context of key passages. Cavanagh’s work may be of interest to Biblical scholars and curious Christian believers, as he reexamines core tenets of the faith through the lens of the social, religious and historical context from when the beliefs themselves came to be. Xlibris Publishing New Zealand, an Author Solutions, LLC imprint, is a self-publishing services provider dedicated to serving the needs of Kiwi authors. By focusing on the needs of creative writers and artists and adopting the latest print-on-demand publishing technology and strategies, we provide expert publishing services with direct and personal access to quality publication in hardcover, trade paperback, custom leather-bound and full-color formats. To date, Xlibris has helped to publish more than 60,000 titles. For more information, visit xlibrispublishing.com.au or call 0800 443 678 to receive a free publishing guide. Follow us @XlibrisNZ on Twitter for the latest news.